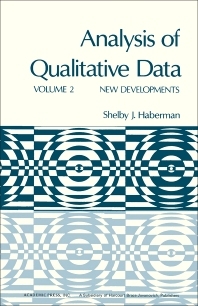 Analysis of Qualitative Data, Volume 2: New Developments focuses on the variety of models used in the analysis of qualitative data. The book first elaborates on multinomial response models and incomplete tables. Discussions focus on models for incomplete tables with ordered categories, incomplete two-way tables and migration, multinomial response models for one or more continuous independent variables, and multinomial response models for two-way tables. The book also reviews symmetrical tables and adjustment of data, including the adjustment of marginal totals using unsaturated models, symmetry models for multi-way tables, and distance models. The publication ponders on latent-class models, as well as models with several latent variables, iterative proportional fitting and latent-class models, maximum likelihood equations for the traditional latent-class model, and the scoring algorithm. The manuscript is a vital reference for researchers interested in the models used in the analysis of qualitative data. Multinomial Response Models. Incomplete Tables. Symmetrical Tables. Adjustment of Data. Latent-Class Models. Appendix: Computer Programs for Computation of Maximum Likelihood Estimates. References.